HomeNews & EventsCarriage House has a new Fall Schedule! Carriage House has a new Fall Schedule! 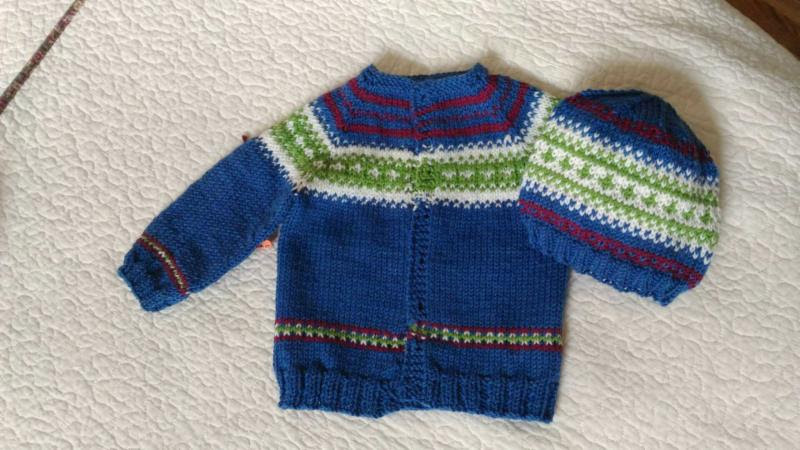 In this class you may knit a sweater for a child or adult. 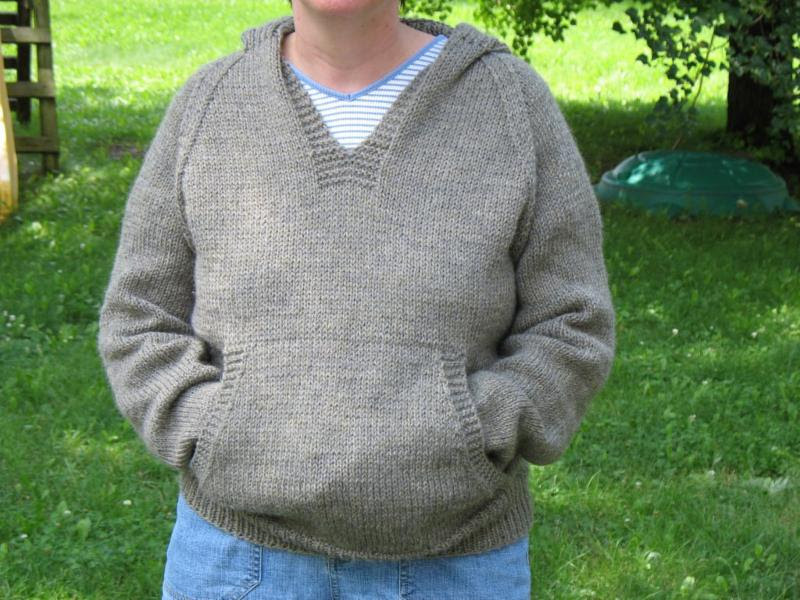 This is a very popular weekend sweater knit for warmth and comfort. It’s a suitable knit for anyone with basic knitting skills that wishes to start creating garments. Knit with worsted weight yarn. Limited seating class so sign up ASAP. 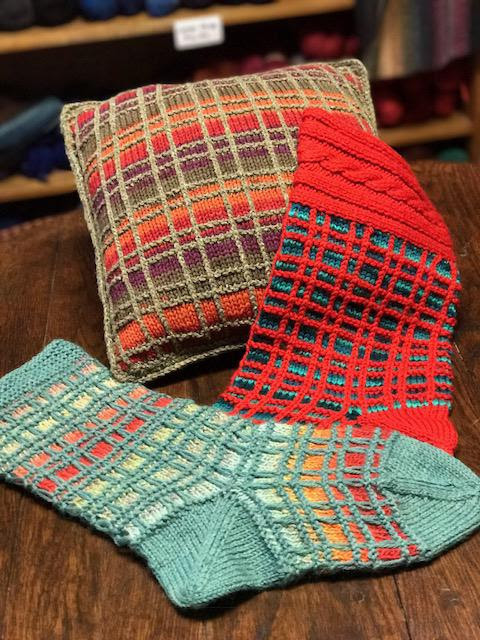 In this class you may choose 1 of 3 projects to create a beautiful knit plaid pattern. With the holiday season fast approaching you may want to knit a stocking. Basic knitting skills are required to take this class. The projects are knit with worsted yarn. Sign up today! 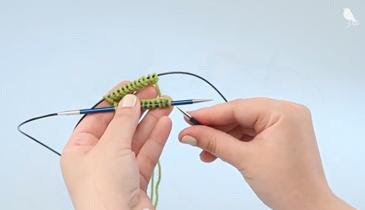 You’ll be learning the basics of knitting in this class and well on your way to creating simple knits. Jennifer will offer an intermediate class after the completion of this one. Sign up today and join in the fun! In this class you’ll be learning the mitered square technique while creating an absolutely beautiful bag. 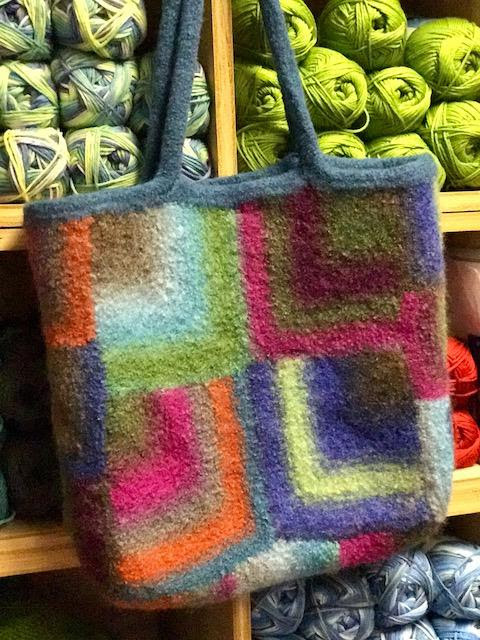 This is our most popular bag and you can most certainly knit one for yourself with a bit of instruction. Basic knitting skill are required. 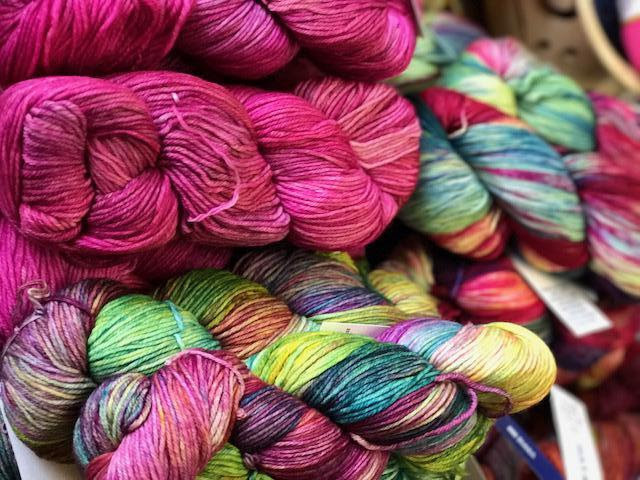 We have lots of color choices! On my needles right now is a Touchstone Shawl by Fogbound Knits. It’s a free Ravelry download and is a very simple well written asymmetrical shawl pattern. This knit is suitable for a beginner but interesting enough for an experienced knitter. I’m using two colors of DK weight yarn and knitting with a #7 needle. The fibers are Malibrigo Merino Superwash DK and Vintage DK. Of course this is not my only WIP! I’ve knit several “Violet Waffles” hats in the last month in different yarn weights. If you like to knit hats, I suggest this pattern which is a free Ravelry DL. No more DPN’s after you learn this awesome technique of knitting in the round. You’ll be knitting a ‘Barley Hat” by Tin Can Knits. After you master the technique you’ll be ready for “Socks 2 at a Time. “Fair Isle Sweater & Hat” with Betty Berry. This class will be scheduled soon! If you’re interested in this class please let me know. 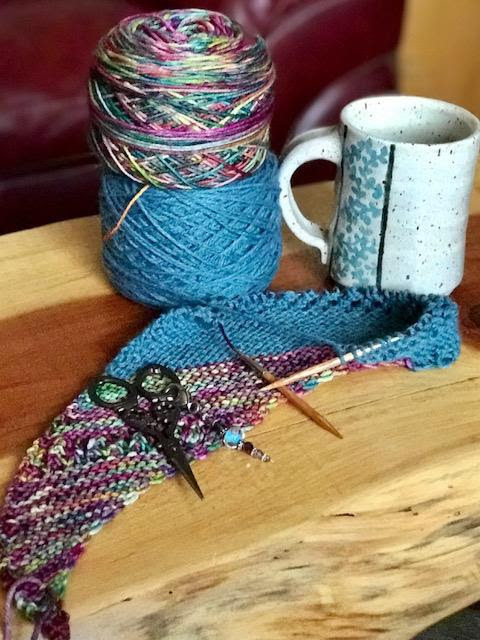 This project is knit with worsted weight yarn. All summer apparel is 50%-60% off! New fall styles are coming in weekly in all merchandise. Our 2017 Kingsport Ornament should arrive at the end of October. The ornament this year represents our new Centennial Park located on Main St. and is #20 in our Kingsport series. We are stocked with Centennial mugs right now but if you want them for Christmas gifts don’t wait because what we have now is the last order. Follow us on Facebook for current news of what’s going on in the shoppe.